300th post and some self promotion! HOLY CRAP! 300 posts! How did that happen?! Many many thanks to everyone that subscribes, comments and in general lurks this blog. Without you all I would have abandoned it all a while ago. I hope I continue to entertain and inform! I have a lot of projects coming down the pipeline and I really look forward to sharing them all with you as soon as I can. To inform, I have a link that all you self promoters might want to check out. I got turned onto this over the weekend (thanks Rodney). It is about.me and it looks pretty interesting. About.me is currently in beta but you can sign up now and reserve you name. You will be notified when you can actually activate your account later but the important part if that you lock your name in. They provide a splash page and link hub where you can then direct folks to your blog, online portfolio or Facebook gallery featuring your prodigious drinking skills. Definitely looks interesting and if you are like me and trying to maximize name ownership (Christopher Burdett) on the internet I suggest heading over and reserving your name! Thanks again to all of you, without your participation and encouragement I could not keep this going! While visiting my wife's family in Georgia for Thanksgiving we caught up with an old friend my wife had not seen in some time. He now owns a surplus business and while visiting him we got a tour of his warehouses and facility. Really amazing set up and an astounding selection and quantity of items, ranging from electronics to toys to records to traffic cameras. It was a lot to take in and really neat to see. RAWR! I am a small part of a monster! 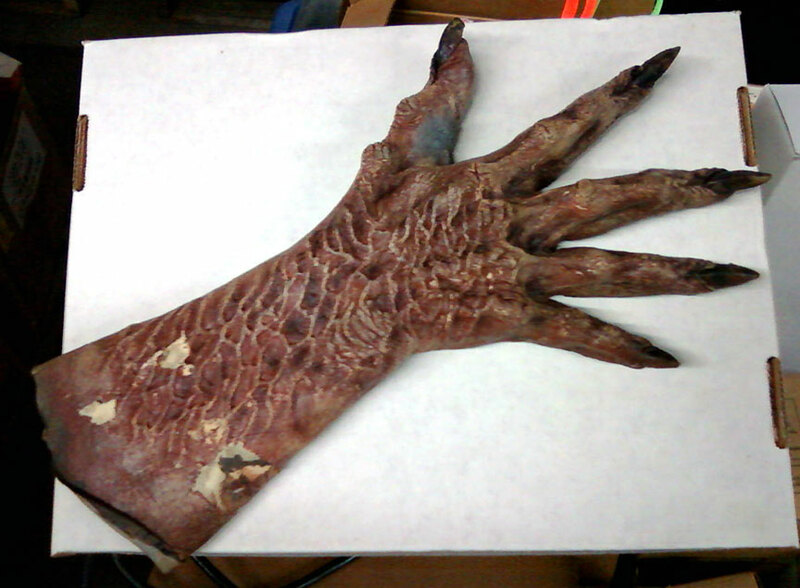 I made this glove while working on Buffy the Vampire and Angel. I think I made this for Angel, for the Sahrvin Demon army. I will need to do some research when I get home to know for sure. But I clearly remember painting it and recognize the wear and tear from filming. Not sure how this glove made it all the way from Los Angeles to Georgia but it was sure nice to see it again. This makes me wonder what else escaped LA and might be lurking out there in random boxes in warehouses. Another example why I have ham for Thanksgiving! Hope everyone has safe travels and good family times in the places of the world that celebrate Thanksgiving. For this project I was assigned to redesign the Tojanida. 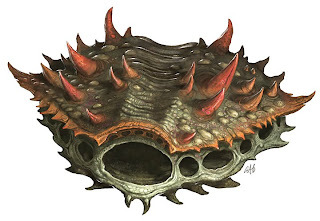 The Tojanida has always been this crazy mixed up thing but I was able to get in there and give it some of my monster love. 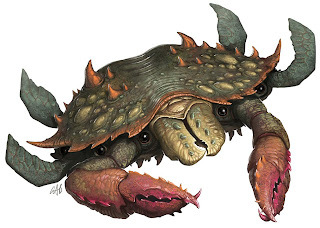 They wanted something along the lines of a crab with a snapping turtle beak with some flippers thrown in and I was happy to oblige. It just so happened that I had a ton of crab reference laying around from a piece I had recently finished for myself so I had a lot to draw from as I worked on these. Needless to say I had a ton of fun working on the Tojanida redesign and these pieces. It is hard to go wrong when you get to add your own voice to a project this way. As always a big thanks to Sarah Robinson for getting me involved on this projects! 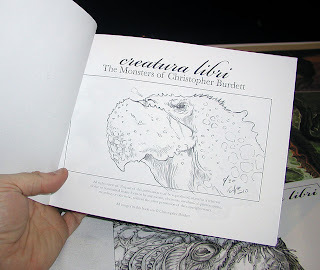 While at Illuxcon a lot of people mentioned having seen my blog, or at least heard that I took part in the blogging arts. On Saturday night I participated in an interview for the WIP podcast regarding my thoughts on blogging and my blogging activities. Since internet was extremely spotty in my room I took to posting and writing my blog out in the hotel lobby during Illuxcon. This lead to many comments along the lines of, "Are you STILL blogging?!" I usually played it off my pressing my fingers together and acted as if I was typing with the whole of my hand. 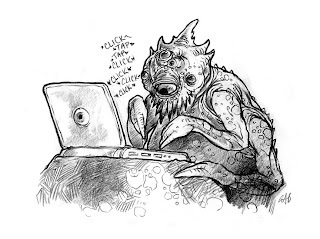 Which of course got me thinking... about monsters... and their blogs. 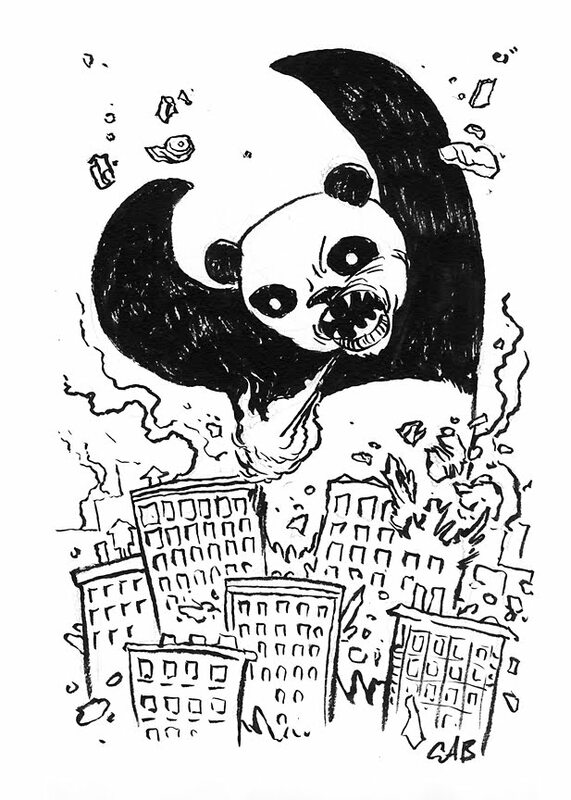 Since I had a lot of time to kill in airports on Monday after all the flight delays I eventually started doodling. 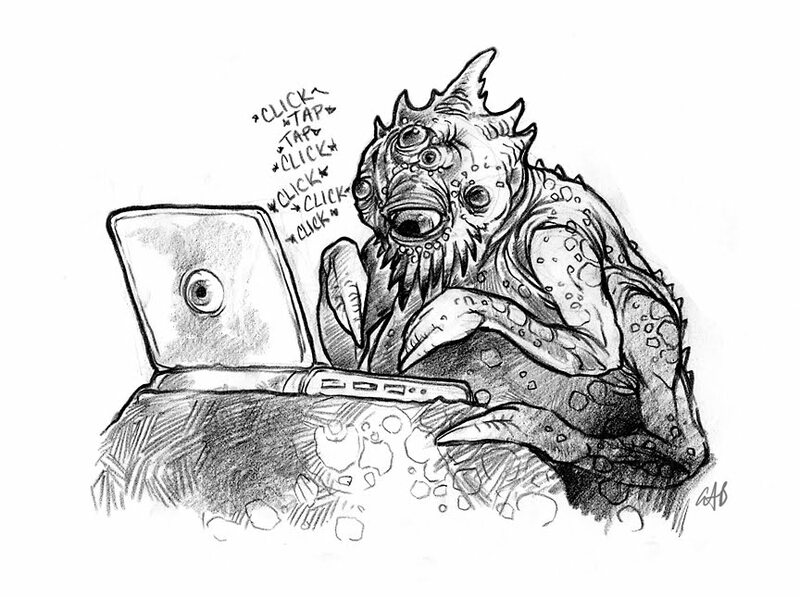 ...and a blogger monster appeared. I am still recovering from Illuxcon. I was up at 4 am on Monday to fly back to Florida on a 5:45 am flight. Due to fog in DC our journey stretched out into a 15 hour trek through 6 airports and we didn't get back to Florida until after 8pm Monday night. The luggage on the other hand... It was not back to us until yesterday afternoon. Thankfully everything arrived more or less intact and in good shape. The heavy handed TSA agents in Altoona gave me fits as they tore through my carefully packed suitcase full of original art and all my gear from the showcase. Glad to say it is all back and safe and I am slowly getting my feet back under me after a truly amazing weekend at Illuxcon. 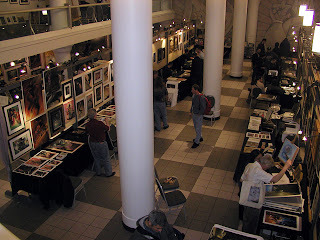 I would like to again extent huge thanks to Patrick and Jeannie Wilshire for everything they do to make Illuxcon happen. 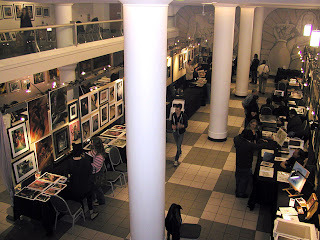 Illuxcon 2 was so amazing and Illuxcon 3 was a thousand fold more amazing. 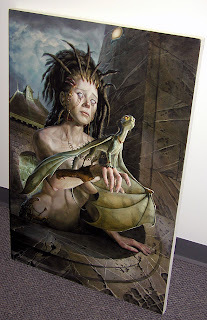 I can't wait until Illuxcon 4 and I know I am not alone in these feelings. 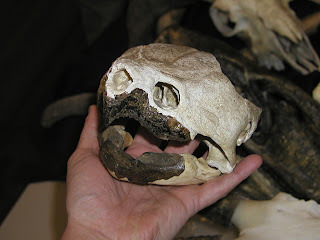 One of Lars Grant-West's skulls that he brought for his lecture. This is the closest thing to an incriminating photo I could come up with this year. Will need to try harder next year! 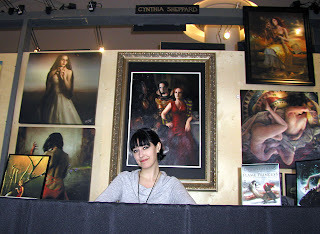 Day 4 at Illuxcon! These past full days of awesomeness have begun to weigh heavy on me. A bit of a slow start today, but I am ready to dive into the last day. I can catch up on sleep later, I just don't want to miss anything! There are no demos or lectures scheduled for today, just time to walk the hall, talk to folks and to absorb what defines the artiest that are set up in the exhibit hall. One of the days highlights is Greg Hildebrandt steadily working on his massive Smaug painting. He worked away while answering questions and giving insight on his years in the industry. Greg Hildebrandt hard at work on more scales. Still feeling like there is so much to see. Seemed like everyone else has the same feeling. One of Jordu Schell's marvelous beasties. 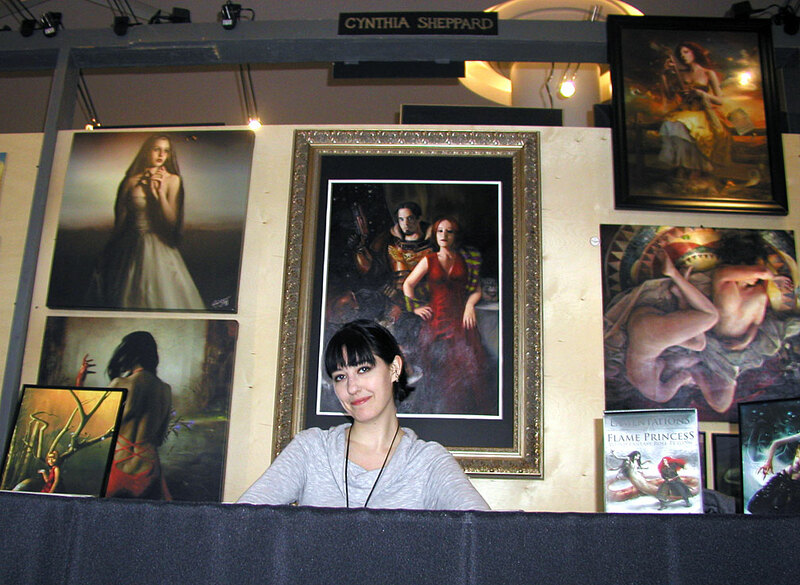 The talented Cynthia Sheppard making her debut in the exhibition hall this year. 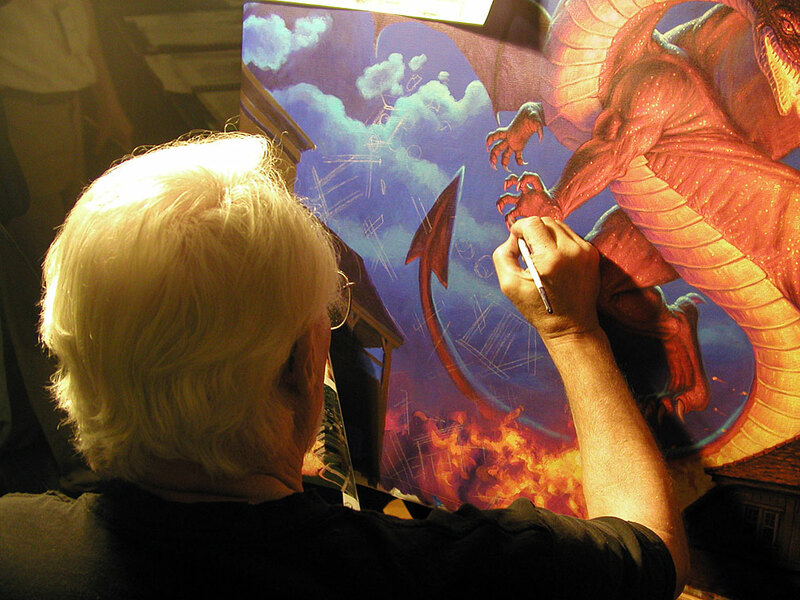 Checking in with Greg Hildebrandt. Still hard at work! 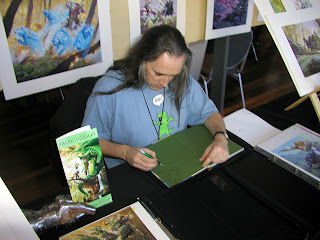 Todd Lockwood indulging a super fan. Todd graciously signed a suitcase full of books. Another reason Todd sets the bar for awesome. My newest Lars Grant-West painting that will look great on my wall! Thanks Lars! 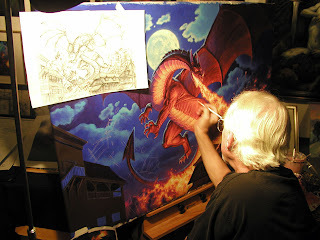 Back to Greg Hildebrandt, he is a dragon painting machine! Another angle of the exhibition hall late in the afternoon. Some bare walls begin to appear as the artist prepare for the nearing conclusion of Illuxcon 3. I had the chance to again find myself interviewed for the Ninja Mountain Podcast. Jeremy HcHugh… or should I say Jacob McNewcastle (thanks Lee!) 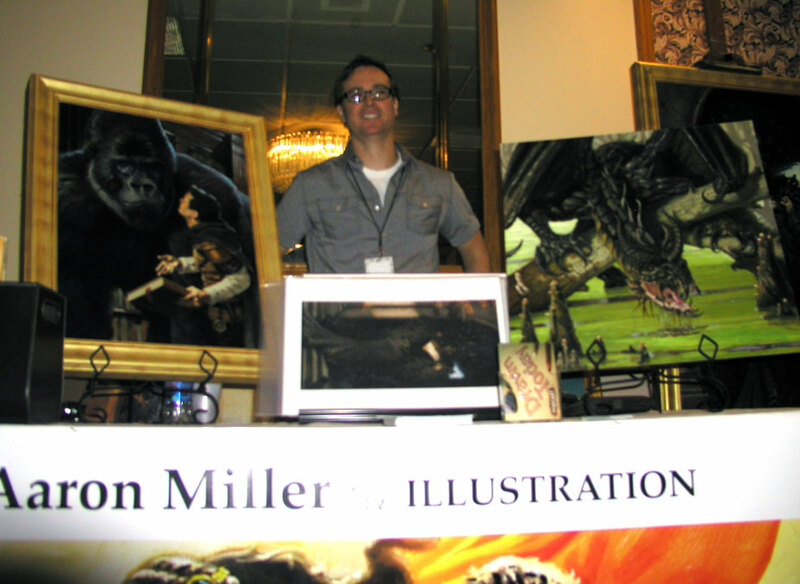 interviewed me about my experiences at this year's Illuxcon and about my thoughts on creature design. We had a fun talk and I hope I didn't should too much like an idiot - which is my perceived default for things like this. I will let you know when the interview goes up so you can give a listen! Reference for my newest painting… Self Portrait with McHugh. As the afternoon wore on those who arrived by car began to depart for home. 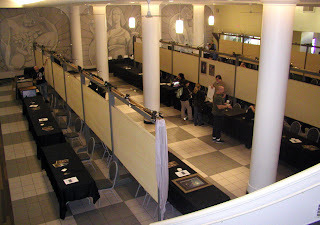 Finally the 5 o'clock hour came and thus marked the official end of Illuxcon 3. Those flying out on Monday broke off into groups for dinner and regrouped later in the evening at the hotel. There was some nice socializing in the bar and lobby and everyone was reflecting on the last four days and looking ahead to implementing what they learned at Illuxcon. 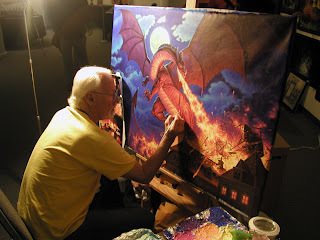 I had a chance to visit Ralph Horsley's home and where he grew up via Google Maps. Thanks for the tour Ralph, it was a real pleasure! I had to make it an early night of it since I have a 5:45 am flight back to Florida. Another Illuxcon has come and gone and I am better for it. I have a lot to distill, process and then to implement into my work. I was at a certain place with my work last year at this time, today I am in a much better place. I now see where I need to go and I have been shown the path. 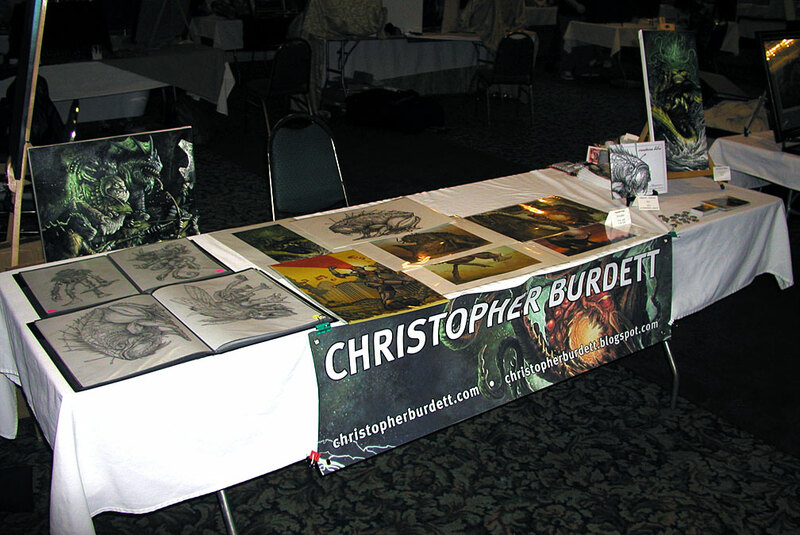 Navigating the path and blazing my own trails will be my job for the next year until Illuxcon 4 rolls around. I hope I can show as much growth in my work as can be seen from last year until this year. 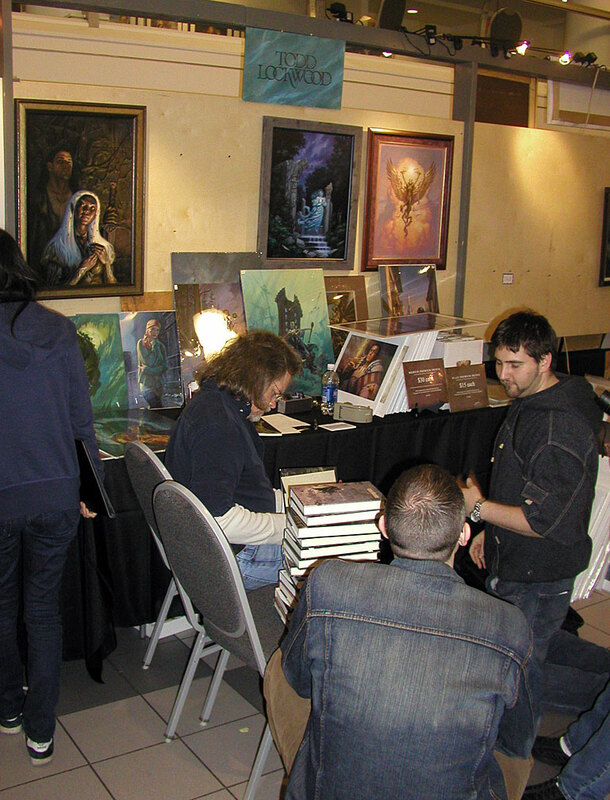 A SUPER BIG THANKS again to Patrick and Jeannie Wilshire for all their time, effort, blood, sweat and tears that goes into making sure Illuxcon happens. You have allowed something very special to happen! 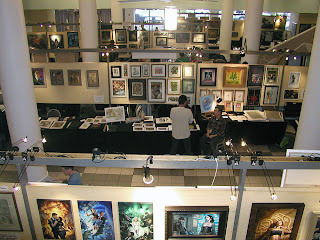 Day 3 at Illuxcon began with some more time at the Showcase. It was much more low key and very enjoyable. 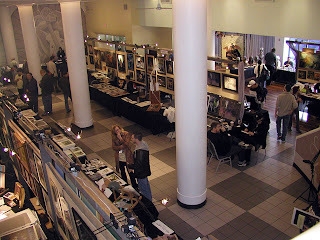 Many wondered if the lower key atmosphere was because of excessive drink the night before or that many of the Illuxcon attendees took it in the night before. 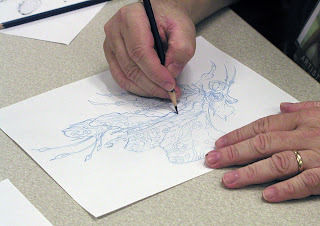 The slower pace of the morning allowed some time for the artist to get around and take in all the other participants work. Taking advantage of some slower moments I got around to some artist neat me and made sure to take some really high quality photos. 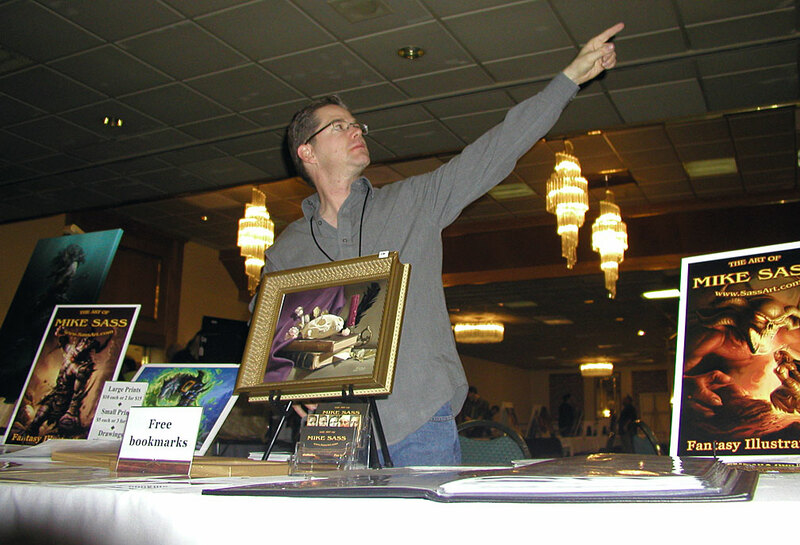 Mike Sass points to the bright shining future of art! 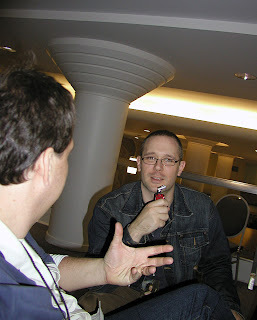 Another strangely bad photo of Aaron B. Miller… sorry Aaron, one of these days I will take a good one. 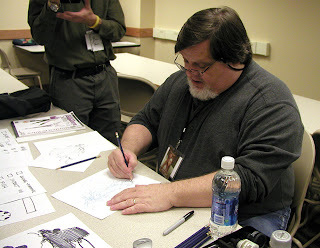 When I got to the Exhibit Hall I made sure to take in Mark Nelson's inking demo. Really great to see him work and to see how skilled he is. 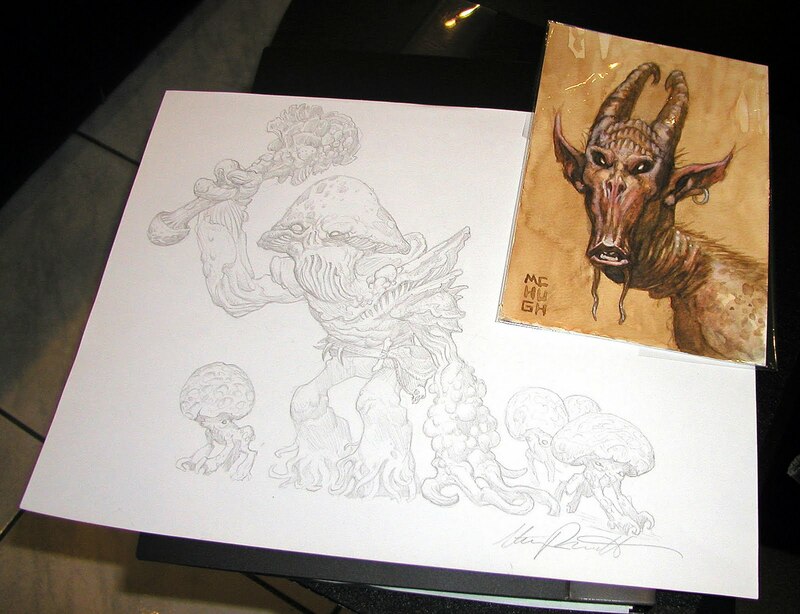 Mark is an incredible draftsman and can't truly be appreciated until you see his work in person and to see him work. 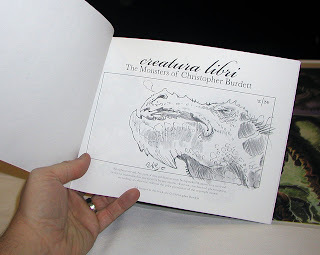 I had time between seeing Mark work and going to Lars Grant-West's lecture on using reference for dragons I made to rounds of the Exhibit Hall. 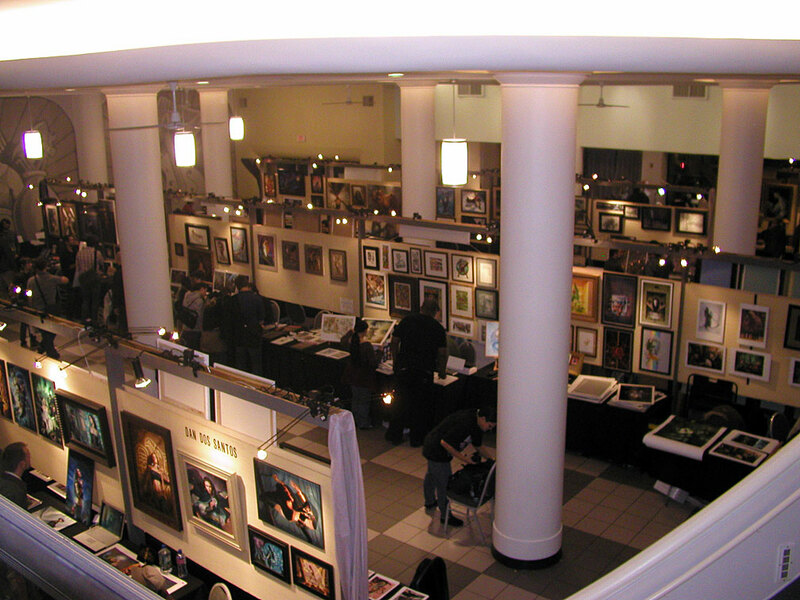 I still feel like I am missing so much even though I have walked down each isle and looked at every booth. 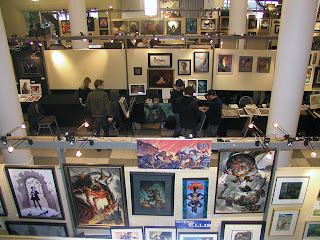 I made sure to stop back by many artists booths to touch base and to get a proper photo of them and their work. 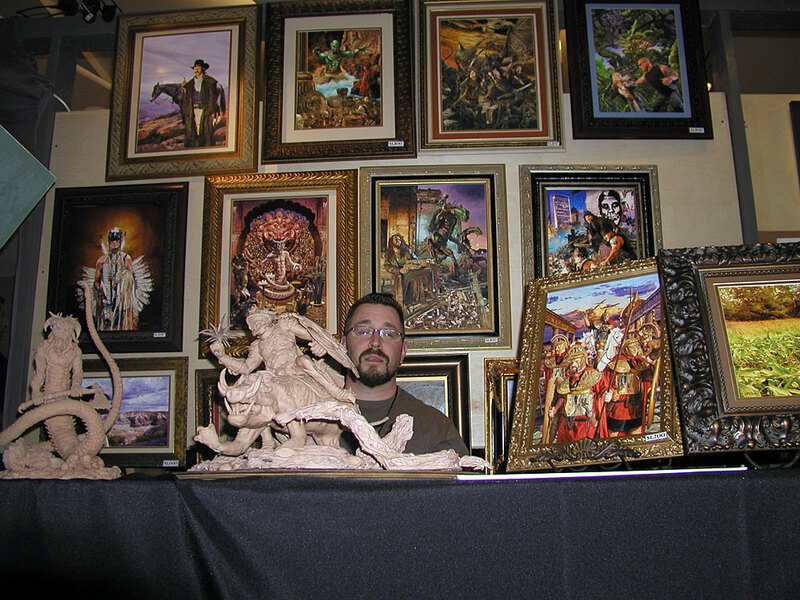 Ralph surrounded by all his amazingly awesome work! The Exhibit Hall remained busy all day and into the evening. I also made some time to buy and trade for some more art! 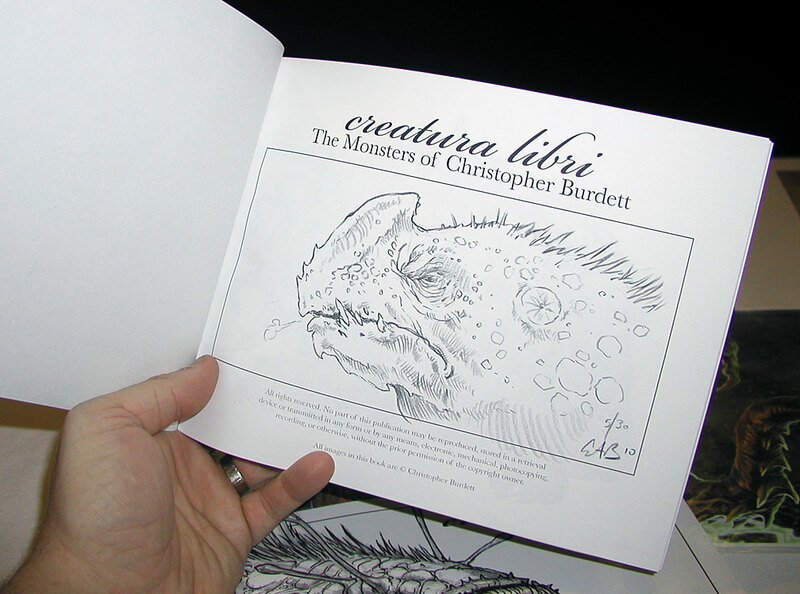 Passing up the opportunity to get more original art seemed silly and I found some artist that obliged. 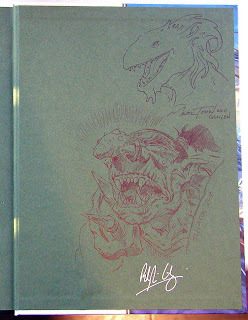 Steve Prescott actually cut a page from his sketchbook that I really liked! Now that is service. The great and powerful Jeremy McHugh did some trading with me and now I am the proud owner of a second original McHugh. Drawing by Prescott and watercolor by McHugh. 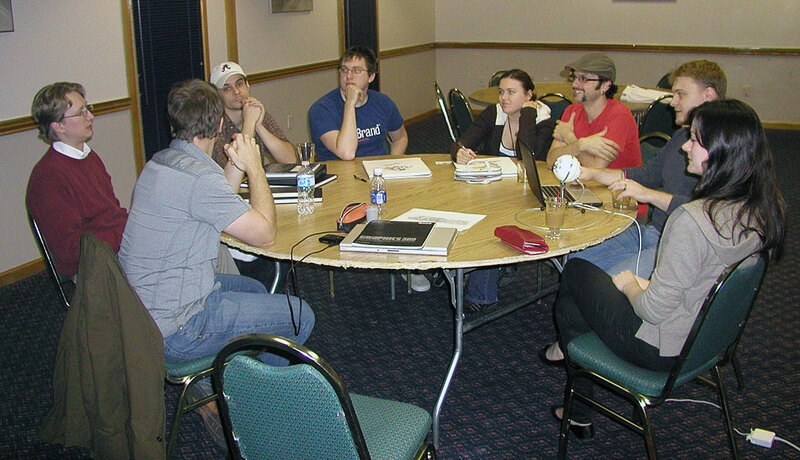 The WIP podcast crew did a Illuxcon wrap up recording and I crashed their recording. Also in on the recording were some of the Drawn Today and Ninja Mountain Podcast folks. A really fun time and hopefully out of the nearly 2 hours of recording we did I did not ruin too much of it. Recording the gold that is the WIP podcast! There was much socializing to be had in the bar, lobby and halls of the hotel and folks seemed committed to keep this going until the wee hours of the night. 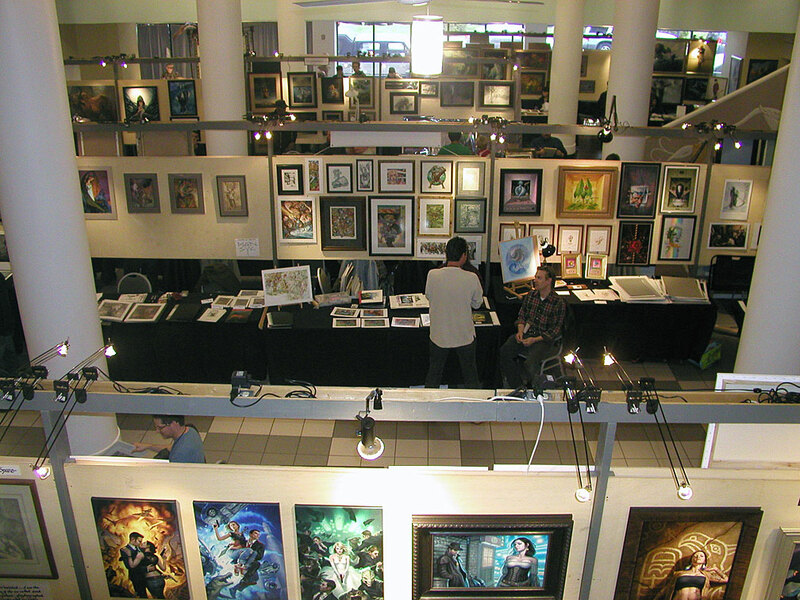 Only at Illuxcon can you have this kind of one on one time with such a huge selection of skilled artists and influential art directors. These moments of socializing are worth the price of admission many times over. Sunday is the last day. Only a handful of hours to see and do anything that was missed over the last three to four days. When I think of Day 2 of Illuxcon I will think of a day starting with a shower running out of hot water in the middle of it's use, a whole lot of awesome and art and then being seated at a table surrounded by loads of other artists and talking to loads of people about my art. Today's post might be more photos then content… it began to all blur together as I think back about each separate moment. Good thing I took loads of photos to remind me! 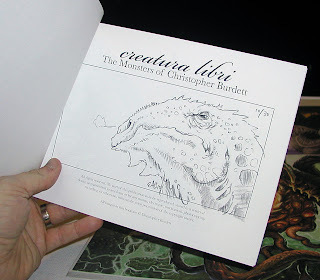 The first things I did when I got to the exhibit hall was to take in Mark Nelson's Creature by Committee demo. 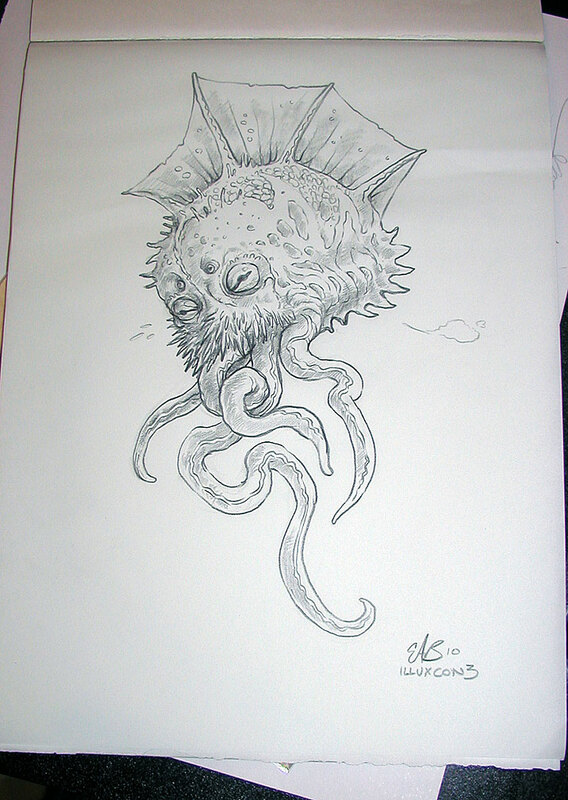 He gave the group options to choose from and we votes and based on the votes he designed a creature. The group decided that Mark created a insect that is prey and lives in the arctic. There was additional voting for the over all silhouette, number of eyes, number of antennae and what various body parts might be used for. Mark begins to work on the committee creature. The creature is taking shape! 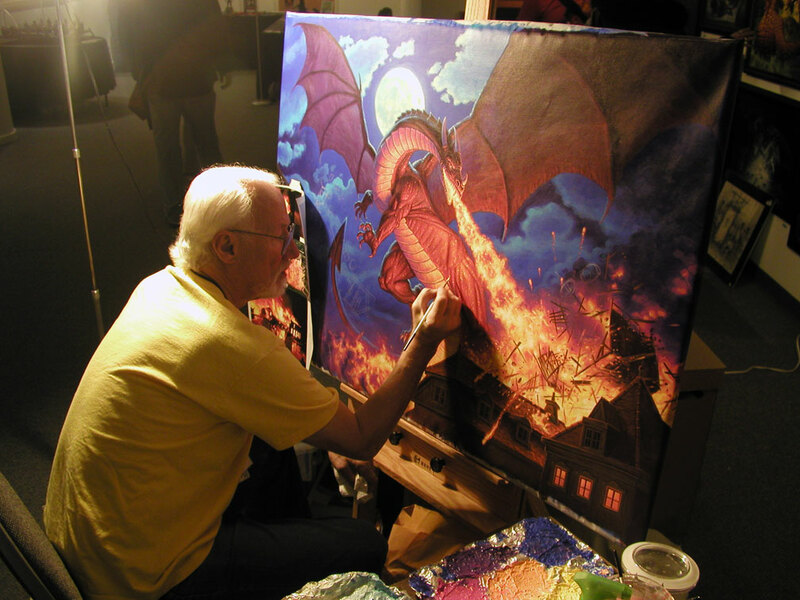 While I was watching Mark's demo Greg Hildebrandt was hard at work on his Smaug painting on the upper level of the exhibit hall. 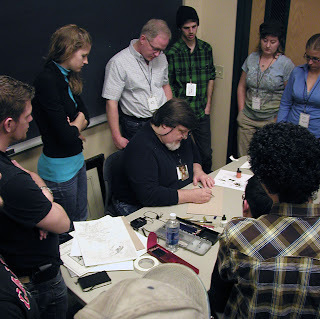 He was answering questions and showing everyone just how easy the awesome flows from his hands onto a canvas. Greg Hard at work on shining scales. 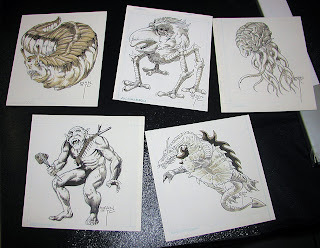 Speaking of Mark Nelson's drawings, I was lucky enough to be able to trade some of my work for that of Mark's! This was not just any work… this was some of his monster manual art from the 2nd Edition Dungeons & Dragons Monster Manual! He has a huge stack of these that he called his 'dirty laundry' and I got to take my pick. So cool and so amazing and now they are mine! 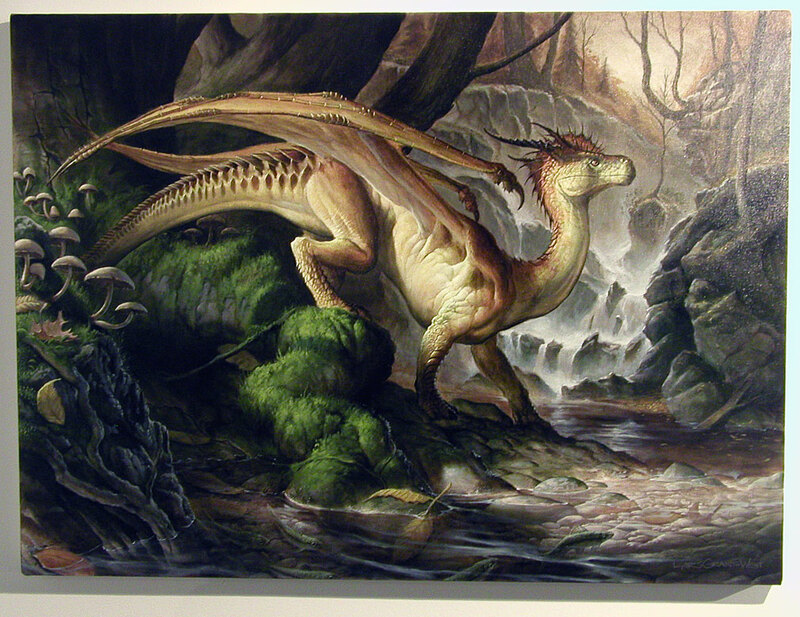 Finally was able to get a passable photo of Lars Grant-West's Autumn Dragon. If my gut feeling is accurate he will not be going home with this gorgeous piece. So beautiful! Lars knows his dragons. My quest continues to get every artist that worked with me on the Monster Manual 2 to sign and hopefully sketch in my copy of the book. 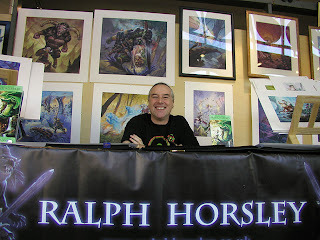 I scored big with Ralph Horsley! 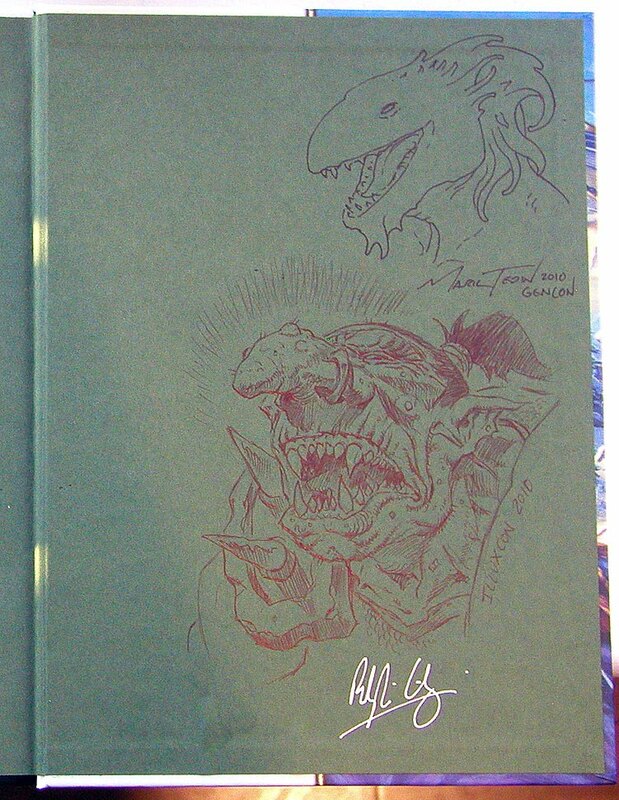 I could not miss my chance to finally get him to contribute and he really blew me away with his sketch! Ralph hard at work on his sketch for me. 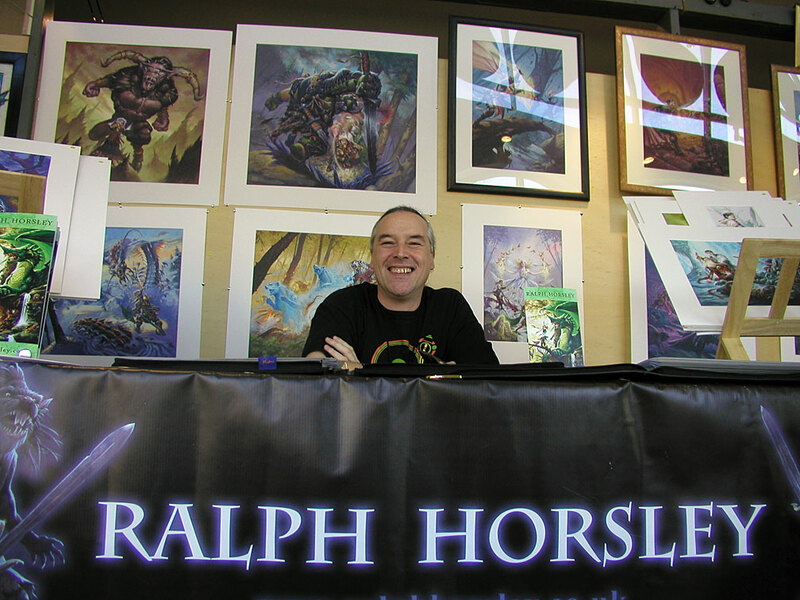 My finished Ralph Horsley original that now is in my Monster Manual! Thanks Ralph! It was a really busy day in the exhibit hall today. Lot to see and do and folks were trying to do it all and see it all at… all at the same time. Quick over here! 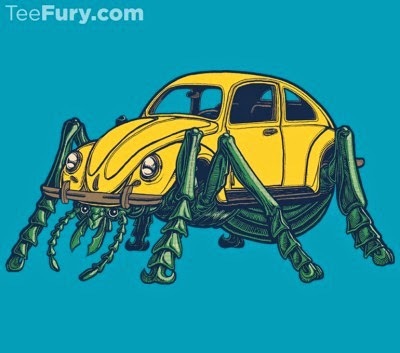 Something awesome! NO, NO! Over here! AWESOME ABOUNDS! I had a really good portfolio review with Jeremy Cranford late in the afternoon and that led into dinner and an early return to the hotel to get ready for the Showcase. By the time I got to the ballroom folks were hard at work getting set up. 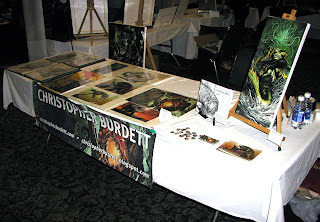 I got my wears out onto display as quickly as I could and get ready for the crowds to arrive. 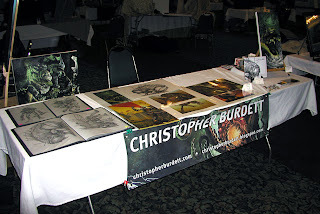 One angle of my table at the Showcase. How your viewing pleasure… another view! It all begins again on day 3 and I can't wait! 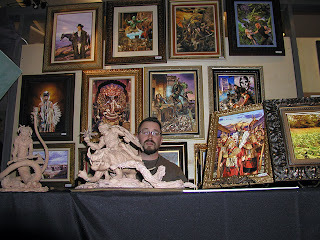 Back to the Showcase in the morning and then to the exhibit hall and a day of demos and seminars!. Illuxcon Day 1! 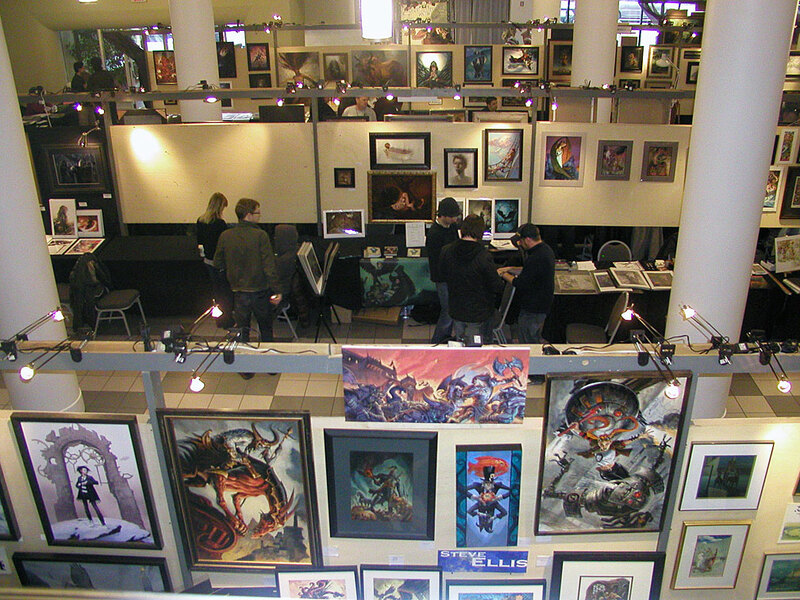 Illuxcon is off to an impressive start this year. A very enjoyable breakfast followed by some socializing at the hotel filled the morning. A parade in downtown Altoona caused the majority of us to stick close to the hotel till it had passed. Once the close was cleared we headed on down to the Heritage Center to see how the set up was going. The awesome was already being turned up to 11 by the time we got there. 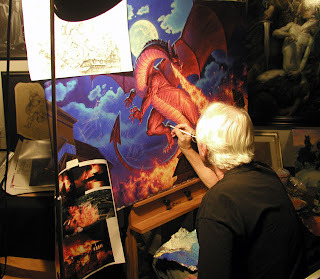 Ralph Horsley had cracked his box open and amazing gorgeous work was spilling forth. 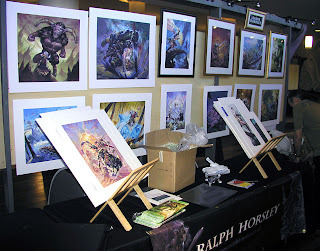 Finally seeing Ralph's work in person was indeed a special treat. 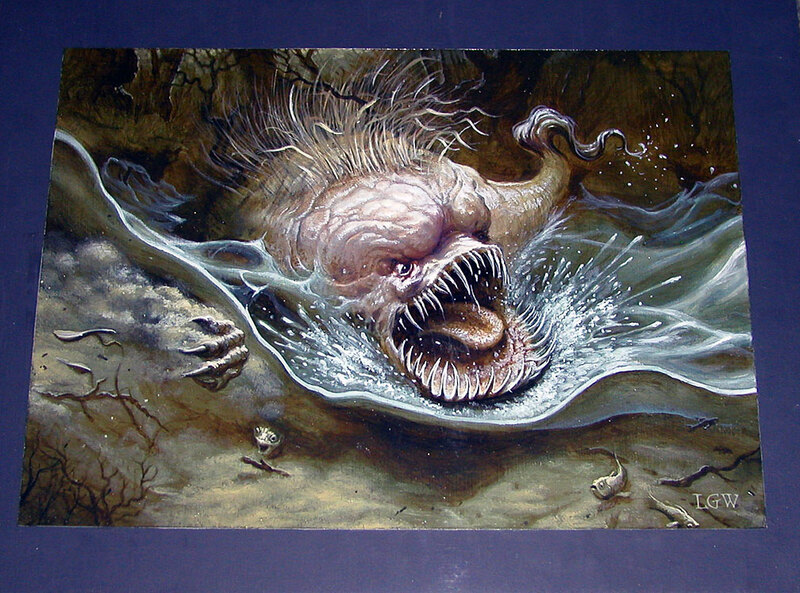 As I have said last year at Illuxcon and at Gen Con, seeing any reproduction does not do the original any justice. The originals are AMAZING! 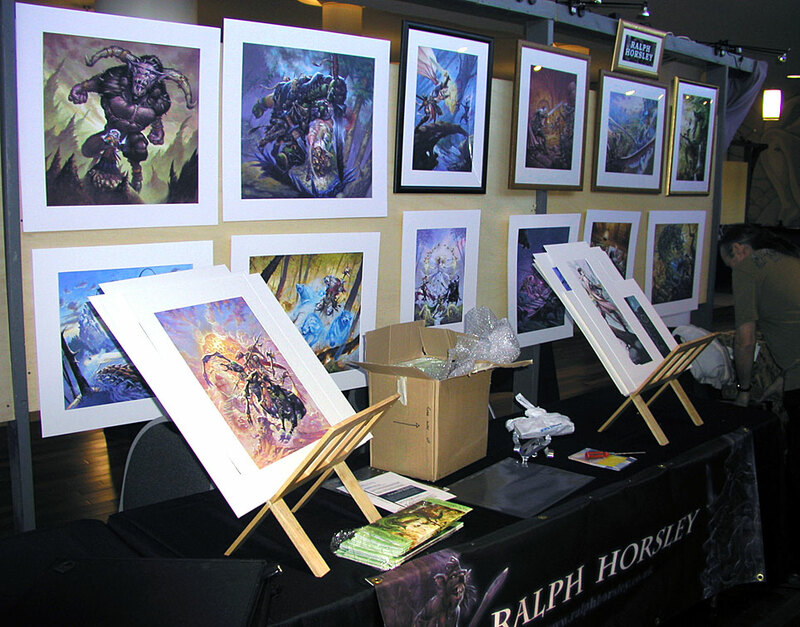 A wall of Ralph Horsley. Did I mention how big they were? Soon there would be more awesome to see. 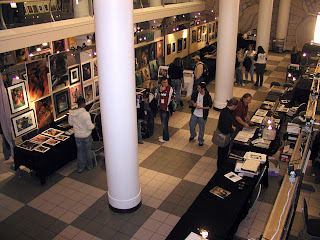 The Hall was still very bare when we got there, but slowly the artist began to arrive. 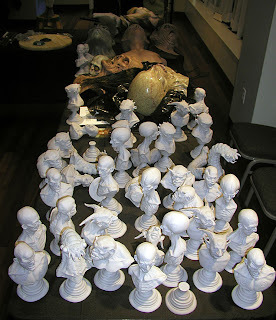 Vincent Villafranca, Jordu Schell and Thomas Kuebler were almost done setting up their sculptures and from the looks of it had been hard at work setting up their displays for awhile. 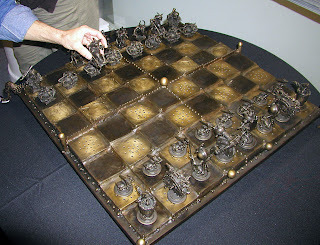 One Vincent's bronze pieces. It centers around the horrors of the first world war. 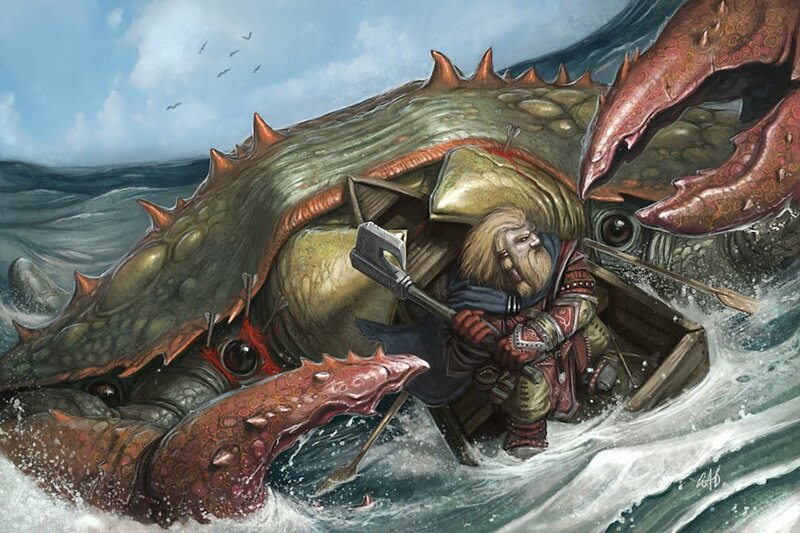 The amount and complexity of detail on this piece is astounding. Jordu's massive collections of busts both big and small await their final placement on the table. 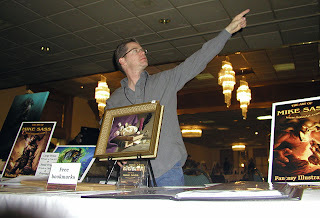 Tom has a large display consisting of two figures and a flying monkey. This is a close up of the main figure. Creepy and cool in the flesh! As the afternoon progressed the hall filled. Familiar faces began to arrive. 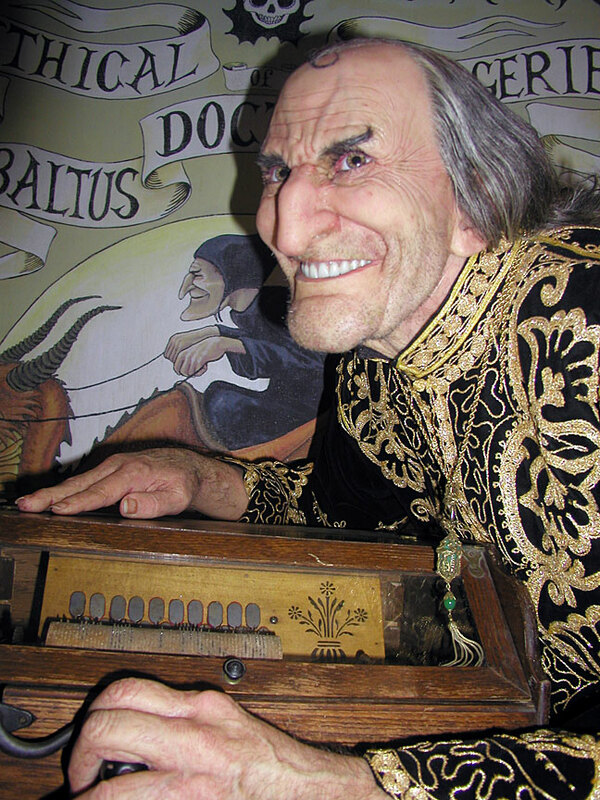 It was really starting to feel like Illuxcon. 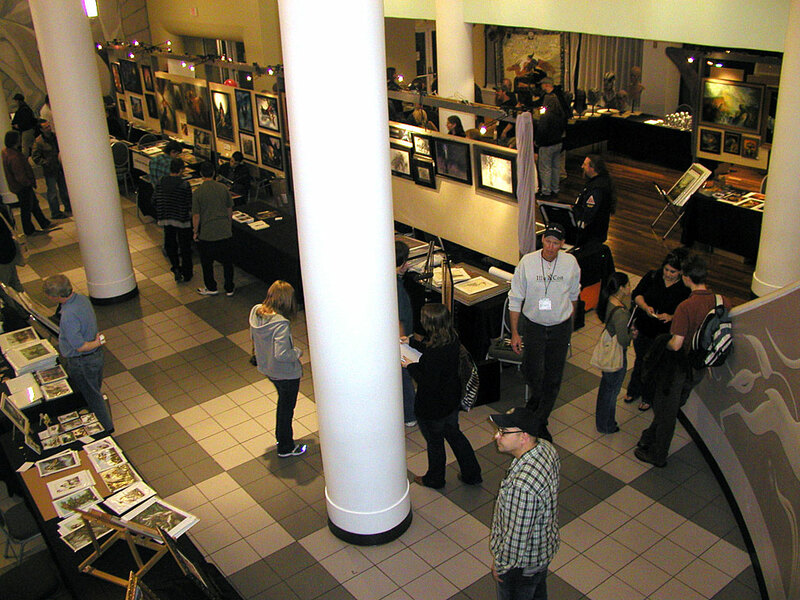 More and more art fills the hall. 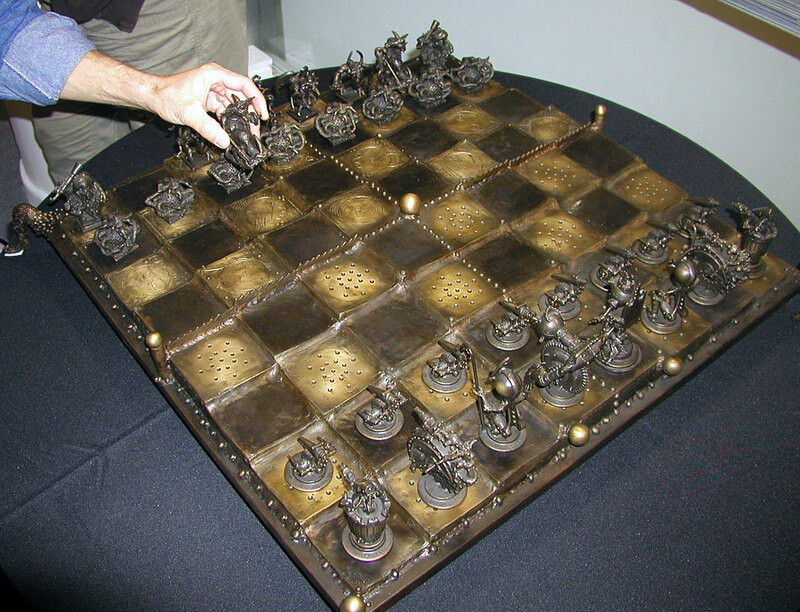 One of the interesting pieces that showed up later in the afternoon was an entire chess set created by Vincent Villafranca. 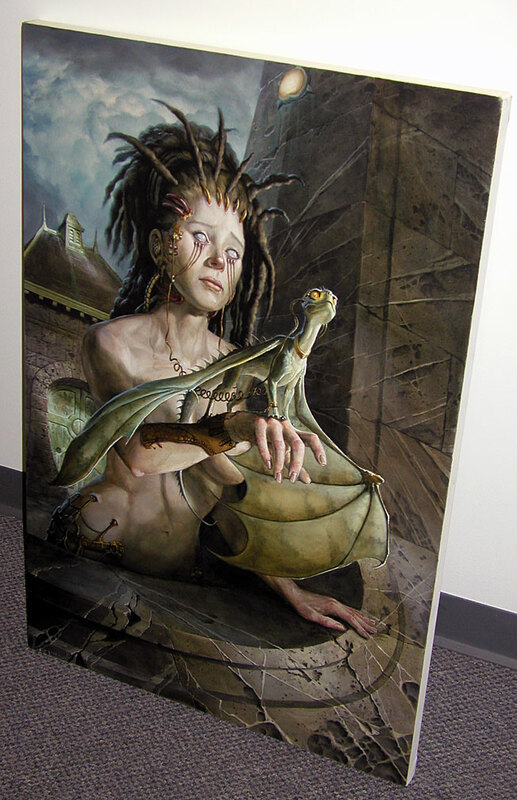 It was a private commission and the owner brought it to the show for display. The set is robots vs. monsters and is candy for the eyes. Vincent had actually never seen the set all together since he sent off the pieces as he completed them. Definitely one of a kind! I am rooting for the monsters to win! 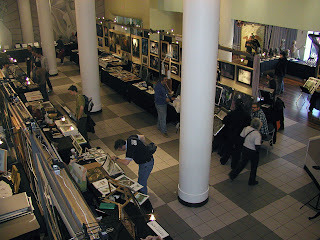 Six o'clock arrives and it is now finally the official start of Illuxcon 3! The hall was jammed pack and the excitement was palpable. 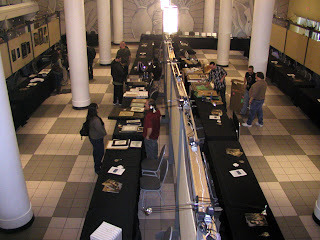 It seems like everyone was ready to begin their Illuxcon 3 experience. The walls and table are full of art and the artists are reporting for duty. So much to see and take in. I already feel I won't be able to take it all in. Lars Grant-West was one of the last to arrive and he didn't disappoint. Lars was responsible for the brochure art this year and the piece is beautiful. 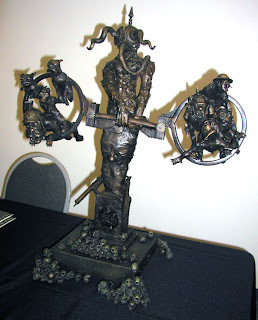 Really excited to see more traditional pieces by Lars. He also finally finished his Autumn Dragon and has it on display. 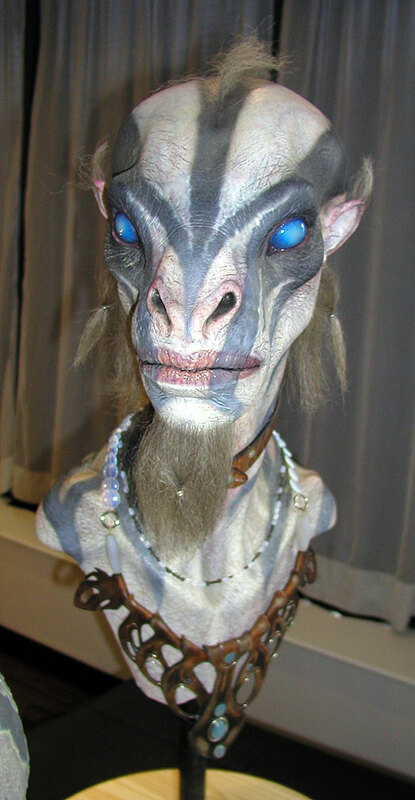 I hope to have a photo of the dragon later in the weekend. 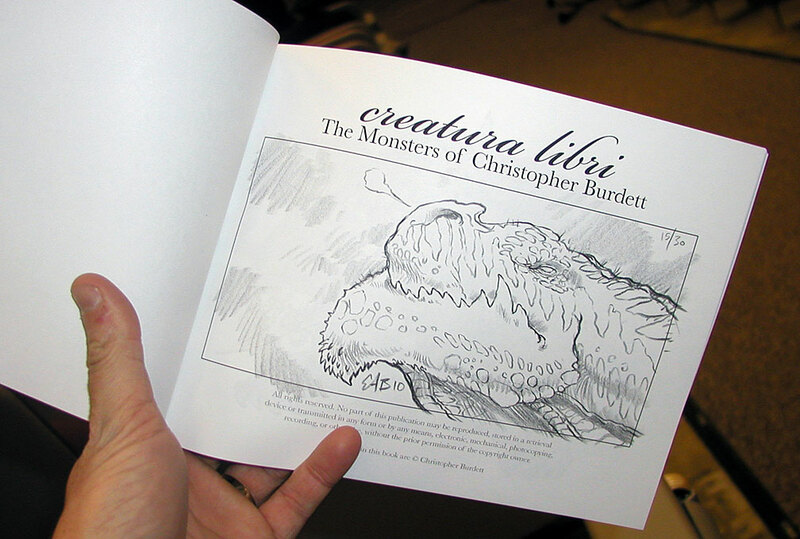 I did get a photo of the brochure piece though! A really big really beautiful piece. 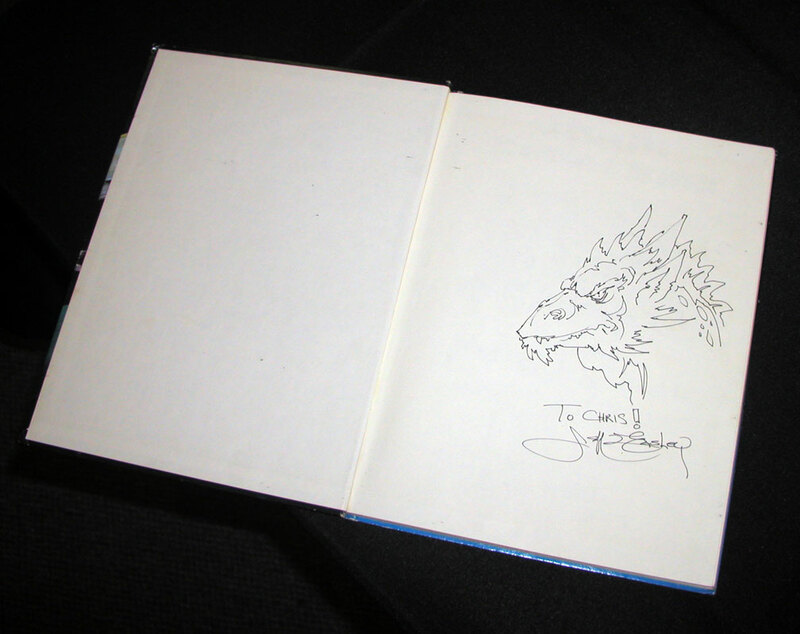 I wrapped up the evening with finally bringing my treasured original Advanced Dungeons & Dragons Monster Manual to Jeff Easley for a signature. He did me one better and capped an amazing day off with a thrilling treat! Wow! Just WOW! Thanks Jeff! More socializing back at the hotel and more folks continue to arrive. Really getting ready excited for Day 2 and can't wait for the classes and seminars to begin! Fresh from the drawing table... Kobold!